I'm still thinking about the very last line in this book. It rattled my sensibilities. I actually gasped out loud. Margaet Maron is such a talented writer. This fifth book in her Sigrid Harald series is my favorite so far. She had a side story going about another murder while Sigrid was solving the case about the dancer thrown to her death, both stories connected by one character. After the dancer case is solved, the tale ends with the side story murder in a vivid scene that likely won't leave your head soon. Secrets are revealed about the dancing company's dynamics and relationships slowly throughout the investigation. Lies are uncovered. I actually figured out the murderer in this book, which made me pretty happy. I had no clue that last line was coming though. I totally love Sigrid Herald and I've been enjoying this series, but I had a hard time with this particular story. I thought it kind of unlikely that, given the circumstances of the murder, the police wouldn't have immediately hauled all of the dancers, especially the male dancers, down to the station for holding and intensive questioning. They probably would have had to let everyone go after 48 hours because they didn't have any concrete evidence on any of them, but it just struck me as so weird that they just let them all continue on as they would. And I didn't really see the point of the whole side story about Dr Ferrell and her Social Services case, other than to make sure the book wasn't too short. It clearly had no bearing on the main mystery; and I doubt we're going to see Dr. Ferrell again, so it didn't add a new character or character development either. If anything it was a lesson in preconception that mirrored the main mystery.Overall, not my favorite in the series, but not a bad read either. 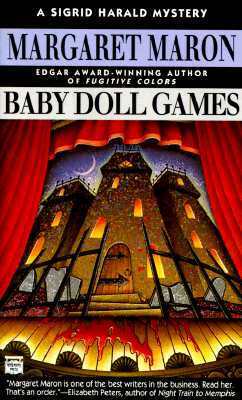 Margaret Maron's BABY DOLL GAMES was quite mysterious and compelling. I did not guess most of the surprises; clues were there but subtle, just as they should be.I am currently enjoying a sequential reading of the Sigrid Harald series, to be ready for the new one she's working on, as I prefer reading a series in order. ;-) * Friends were discussing love scenes and our preference for courteous allusions rather than detailed descriptions of interlocking parts. Here’s a perfect love scene from BABY DOLL GAMES:"No more talking," he murmured as their lips met again.She awoke sometime in the night . . . I liked this one a bit more than some of the others, and as they teeter between 2 and 3 stars, 3 stars!Maron often spends a significant portion of her set-up chapters describing the geometry of the crime scene minutely. Each time, I try to hold the steps in my head to build a picture, but for some reason, it doesn't work for me. Then I just read on anyway, wondering if I'd figure things out sooner if I put more effort into it. Oh well. This is a quick read! and fun - as a mystery can be.I read all of the Deborah Knott books up to 1988 when this Sigrid Harald was published. A check of Amazon shows that now there are 20 Deborah Knott tales and at least 8 Sigrid Harald books. I see a visit to the library! (once I get my card renewed! )I highly recommend. I got this for free so it was worth the price but not much more. I hadn't realized when I picked it up that it wasn't part of the Deborah Knott series. This one, set in New York City, has little to recommend it except it was something to read on a trip. BOTTOM LINE: One of the best Sigrid Harald stories, so far (#5 of 8), with a strong theater-based plot (one of my fave sorts of mysteries) and a nice wallop of emotional stuff mixed in as well. A classy-but-flashy child psychologist and her nephew are at a neighborhood dance troupe's Halloween performance for children when the lead dancer is killed, onstage, while under a spotlight, in full view of the audience. Sigrid is assigned the case, and while her roommate Roman is the scenario writer for the production he tries to make himself not too obvious, a good thing, as in earlier books he was awfully florid, um, in a nice way, but a bit overwhelming. Here the focus is mainly upon Sigrid and her team of detectives as they try to parse out what exactly *did* happen, as both the dancers and the audience don't seem to be able to pin anything down for certain. And the opportunistic psychologist doesn't help things much. Maron does something a bit different with this book, putting in occasional short chapters that are the notes from the psychologist's journal, and in these we get to know her rather too well, and she's not exactly a saint. The structure of this novel feels a bit weird at first, though, as it reads more like a linked novella (Sigrid's investigation) and short story (psychologist's working with a particularly difficult client) rather than a truly integrated novel. Although the ending is both shocking *and* effective and emotionally ties into the story somewhat (a tenuous link with the dance company) the two bits are, except for the psychologists' participation, not truly connected. But the focus is not only on the child-like dancers and their free-wheeling lives, but also upon the kids who flock to their small school, and it's well-done. The main interest is upon four children in particular: two brothers and a sister who are always "hanging around, underfoot..." and a child from the neighborhood who was murdered about six months previously. The tying together of the children's personalities, the dancer's personalities and peculiarities, and the murder plot is well-done, and there's the extra added plus - major plus! - of advancement of Sigrid's relationship with Oscar. All together, this, somehow, "works" very well, and delivers quite an emotional punch at the end. It's not you, Sigrid, it's me. I don't like police procedurals and mysteries that have lots of clues involving time lines and room maps. So why am I reading these books? Because I love the cozy series about Deborah Knott, that's why. Somewhere the two series converge when Deborah visits New York. I stopped reading the Deborah novels until I got up to speed on the Sigrid novels. I want to have a sense of who Sigrid is so when the two meet, I can understand where each is coming from.If you like to read mysteries for the puzzle aspect and enjoy working out the clues, this series is for you. If you are like me and read them for the characters and the setting, if you can reread a mystery and not care who did it, you might like the Deborah Knott series better.Both are extremely well written and excellent examples of their kind. I don't know how Margaret Maron is able to maintain the high quality of her series book after book. The woman's a genius. Maron is masterful with this twist on the closed room mystery. The murder occurs on stage in full view of an audience, many of them children. There are parallel stories interwoven. A small group of suspects, members of a dance company. It all comes together in the end when Sigrid has a flash of insight. Intriguing mystery with a bombshell ending.And love the main character. Sigrid is an endearing blend of assurance and insecurity. Her personal and professional life overlap again when her housemate turns out to be the scenarist for the company. There's more character developent with her team of investigators. Her mother, a vague reference in the early books, has become a recurring character interacting with her daughter. And her relationship with Oscar blossoms despite missed signals. This seems to be my week for reading old books.There are two parts to this story - the actual mystery, and the character interactions. Mystery, not much fun. People, amazing.The dance scenes are wonderful, the squabbling actors are fun, the police procedures just drag. And the psychologist's sub-plot is a wonderful contrast with self-congratulatory tone and interesting technique.I like Maron's Deobrah Knott series much better, and the other Sigrid Harald books are also better than this one. #5 in the NYPD Lt. Sigrid Harald series.NYPD Lt. Sigrid Harald series - When a shadowy figure kills a dancer in a little Greenwich village theatre before an audience of horrified children, detective Sigrid Harald is outraged. Her instincts tell her it was a crime of passion but she has no evidence. To find out the truth she uses special dolls to get the children to talk about what happened that night. I'm hooked on this series by Margaret Maron and will read every book. Amazon got me started by offering the first book either free or for $.99. In the first 4 the culprit was someone I didn't want to be guilty, but that was no longer true in this book. The main character is very interesting but I would like her romance to burn a bit brighter. The mysteries always make sense and the other characters provide interesting lives. A dancer, the leading light of a small dance troupe, is murdered during a performance. Lieutenant Sigrid Harald has to figure out which of the other members of the group is guilty and how the crime connects to the still unsolved murder of a child. A basic mystery, reasonably well plotted and with believable characters. A subplot involving a self-centered psychologist and a different crime is distracting, however. More like 2 1/2 stars. Tillie is still out of the picture, recovering from the injuries from the last book, and Sigrid is partnered with a totally unsympathetic, about-to-retire cop. (He was once partnered with her father, but we don't really get to learn anything more about him or his death -- yet.) The therapist made me twitch. The story interested me; however, this is not my favorite series of hers. For some reasons I find the series date and the main character not every likable.The relationships with the cast of characters I did find interesting and thought provoking. Throughout the entire read, the lighting man interested me the most. Didn't actually read this--the paper and ink are SO poor it was painful to try to read. I know Maron is a very well-respected author. Surely Severn House isn't self-published...The quality of the physical book is painful, though. Couldn't get through more than a couple of pages. This one seemed a little disjointed. The subplot with Dr Ferrell seemed out of place, and didn't do much to advance the story, for me. I've read this author before, and really liked her. While this book is okay, I think some of her others are better. Interesting setting though. Exellent blending of three seemingly unrelated crimes. I completely missed the murderers in all three cases. Sigrid Harald is the opposite of Deborah Knott but just as interesting. Started 1-3-10.Wow, the most shocking denouement and way cool. Good setting and characters in this episode. this time we learn lots about dance but the characters are becoming a little more human. Definitely NOT the closing line I was expecting! That kind of blew me away. I really enjoy the books with Deborah Knott as the main character more than those with Sigrid Harald, but Margaret Maron doesn't let you done. All I am saying is, wow! What an ending sentence!